Kid Lit Reviews gives Cooper’s Pack Travel Guides 5 Stars! Posted on June 14th, 2012 in Book Reviews, Cooper's Blog with Comments Off on Kid Lit Reviews gives Cooper’s Pack Travel Guides 5 Stars! 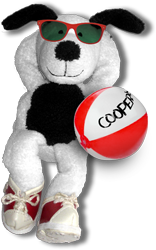 Cooper will also be on the Daytime TV show on June 12th which will be posted here when available. How do you make a summer vacation or road trip fun, beyond just hitting the beach or swimming pool? Here are some helpful tips to make your summer journeys memorable. 1. Learn about where you are going, before you go! • What is there to see? • What is unique or different that you cannot find in your hometown? • Is there something timely that only happens once a year? • Of course everyone loves to hit the beach or swimming pool, but what else is interesting about where you are going? Background: Read a travel guide, search the internet, talk to a relative or friend about their experiences there. If you have an iPad or tablet, download a Cooper’s Pack travel guide which provides an entertaining and fun exploration of a city or region. Goal: Everyone wins when they are invested in trip. If there are multiple kids, make sure each one gets to choose something—and split up occasionally so everyone gets some time alone from their siblings and the family unit. Bring your best friend…if they can’t go, bring your favorite stuffed animal friend. Stuffed animals love to travel too! Background: It is always great to have a buddy go with you. They provide balance and usually keep kids on their best behavior. The cost to bring an additional person, especially on a road trip, is marginal. Background: This is our favorite part: while traveling with Cooper, we’ve met so many wonderful and interesting people. They often ask what we’re doing and sometimes even pull out their own character. You’d be surprised how many people take a little buddy with them. Goal: Instead of taking the same photo of something that everyone else in the world has, by including your character in the photos you are telling a story. This has been the easiest and most fun way to meet new people, from Thailand to South Africa, France to Chile, Tokyo to Greece. People end up sending in their photos of Cooper and their own characters for our “Cooper Was Here” section of our website. Can you believe that Cooper has been to Cartagena, Colombia, Bhutan (the whole country, and I didn’t even know it was a country), or Dubai in front of the world’s tallest building. Bring a small backpack so you can carry your camera, stuffed animal, travel guide, area map and any souvenirs you buy. 5. Carry snacks…candy bar, string cheese, gummy bears, granola bars, etc. Background: You never know when you are going to get hungry and sometimes food is not always available, especially on an airplane. • Buy a souvenir, something small yet memorable that will remind you about your trip for years. An interesting spin on the traditional travel book has been created by the wonderful minds at Cooper’s Pack; their delightful adaptation of tourist destination spots makes a great read for children of all ages. The books showcase a character named Cooper, a traveling pup who visits his friends around the world and learns a thing or two during his stay. A creative mix of fact and narrative educate children while keeping them entertained; something every parent will appreciate. Each book is tailored to a specific destination and introduces a new friend and travel guide to help Cooper find his way. Cooper’s Pack-New York City for example, features Phinney the Bear, an old friend of Cooper’s who takes him on a journey to see the famous landmarks of the big apple. During Coopers’ stay he discovers places like Central Park, the American Museum of Natural History, and Times Square. No time to wait for delivery? Don’t fret if you are already at the airport, each book is available through the app store and can be streamed within seconds to your iPad. Innovative, educational and a front-runner for child exploration, the Cooper’s Pack series are the perfect gift for any young traveler.